Today my symbol is a photo I have shared before but to me symbolises not only Peace, but also resilience, triumph of good over evil and also in a small way celebrates the creativity of our fellow man. Also on the heels of the 10th year anniversary of the London bombings it is a poignant reminder that together we will overcome this adversity and good WILL win over evil and there shall be PEACE. In an age of terrorism where evil is trying its best (so say they in the name of religion) to conquer all, at each turn we are fighting back, not with our fists but with our resilience and our faith in goodness. We will win no matter what. Each time we are knocked we get back up stronger and more united than ever. For more Daily Post Symbol photo challenge posts please go to the link here. Below is my post from a few months ago….. This lovely monument near St James Park was built in 2006 in memoriam to remember the people that were killed in the Bali bombings on October 12th 2002. The monument was designed by artist Garry Breeze and created by sculptor Martin Cook and his son Matt. 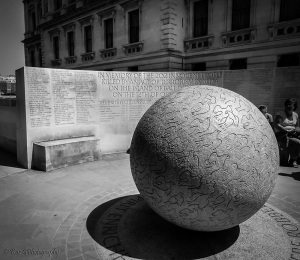 It has two main pieces: a large Balinese-style carving and a 1.5 metre marble sphere that symbolises the victims’ provenance from 21 countries. The carving’s 202 doves honor each person who died, and all victims’ names are painstakingly inscribed on a curved stone wall behind the globe. What a special sculpture—well thought out. Thanks so much. Yes I thought it was great using the doves for each person. It is such a peaceful looking memorial as well. As another anniversary of that awful day nears, it is very fitting Kaz, and perfect for the challenge. It’s a lovely monument to remind us that good WILL win over evil. This is a lovely symbol and reminds me of a memorial to the hundreds of lost sailors from the “Sydney” in Geraldton, Western Australia. Each lost sailor is represented by a seagull.